It’s hard to know if you are on the right path, moving in the right direction, doing the right thing. I move in circles a lot, pondering this question, wondering. Of course, there is no answer, you can’t know the answer until you get where you are going, and then it is too late to ask the question. Along the way we make a million choices, each one a pebble in our path, some round and pretty, some jagged, sharp, occasionally painful. But each one is ours, we claim them with every step we take, whether on tiptoes with trepidation, or running full steam steam ahead, hair streaming out behind us. Choices, always, choices. This or that, here or there, today or tomorrow. It’s enough to make you stand still, sometimes. Afraid. But that doesn’t work either, at least not for me. I can’t just stand here, wasting time, wasting life, wasting possibility. I prefer to be in motion, even if I go the wrong way, get lost sometimes, even if I am forced to retrace my steps. Getting lost isn’t the worst thing that can happen. Neither is falling down. Fear is not the only option. Pick some flowers along the way, breathe in their scent. Look up at the sky, watch the sun rise and set, find the moon nestled in the stars, listen to the trees as they sway in the breeze. Look around you, outside yourself, find all that is there, waiting. Find the joy and the wonder and the things that make you smile. Look for the signs. Nobody has a map of life. No one knows exactly where they will end up. But along the way, don’t forget to watch where you are going. You might just see the most beautiful thing. Oh, I love that: don’t forget to watch where you are going, you might just see the most beautiful thing! A great reminder to start the week with! Thanks. Great Inspiration to start the week! These words are as if I wrote them: “But that doesn’t work either, at least not for me. I can’t just stand here, wasting time, wasting life, wasting possibility. I prefer to be in motion, even if I go the wrong way, get lost sometimes, even if I am forced to retrace my steps. Getting lost isn’t the worst thing that can happen. Neither is falling down. Fear is not the only option” I do that every single day of my life… I try not to panic and go on! Choices are taken every day but its important to be true to yourself and follow you most inner dreams and be passionate at what you do. Your post brings tears to my eyes..happy tears. It’s just what I needed today. so true! so good to watch the scenery as we travel the journey of life. I definitely needed this today. Thank you for reminding me to keep moving forward. 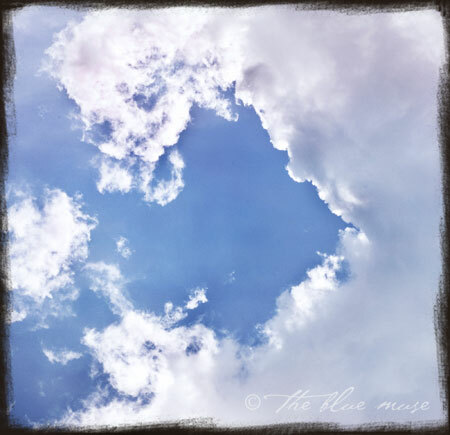 i find much solace in the clouds that pass your way .. a very encouraging post ! Oh, remember in Out of Africa, when Denys gives Karen his compass & says he doesn’t always want to know where he’s going anyway? I am a big believer in getting lost, a truster in my own navigational skills, even when the night is dark and stormy, even when I am scared, I trust my heart. Look around. It’s a fabulous world; even the scary parts have their own magic. WE could walk together. so encouraging my sweet friend. thank you for sharing your beautiful words and imagery. sending lots of goodness to you this week…. I have to agree with Debi. Getting lost can actually be a very good thing. I’m just catching up with my ‘bloglines’ feed after being away from the internet for a few days. Woh! So needed to read those words today, dear friend. Its all too easy to have our eyes fixed so determinedly on the horizon ahead that we forget to look around us, to notice all the sparkling wonders round about and to simply enjoy the journey itself. Relieved to read too that I am not alone in wanting to keep moving, even if it means back-tracking sometimes or even getting lost – its all part of the adventure! Once again, you’ve touched my soul with your tender, inspirational words. Thank you.